Cafe Rubix caught my eye with it’s bold typeface and black shopfront along Middleborough Road, Box Hill. On a Sunday, it’s bustling with people, chilling out and having their meals and coffees. It’s a cute little cafe and their menu offerings is similar to many other cafes around but of course it’s the taste that matters. 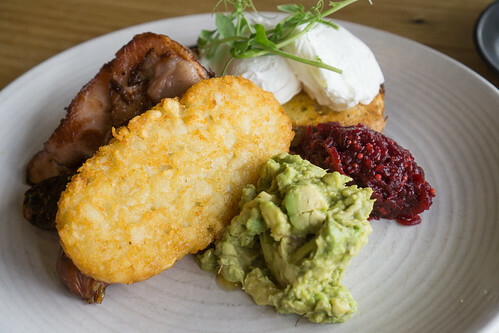 It took my a while to decide but I was dying for hash browns and so ordered the Hungry Badger, it also comes with two poached eggs, toast, chorizo, bacon, smash avocado and beetroot relish. The eggs were nice and gooey as it should be, and the sweet beetroot relish is an interesting addition which provides a bit of tartness to it too. The mashed avo was nicely seasoned, but the bacon and chorizo I found to be a tad overcooked and dry. The hash browns were lovely and crispy! The coffee isn’t too bad too as well! The food-wise it’s decent and service was so-so when I went. Still, I’d probably go back since I’m eyeing the corn fritters.